Police say an arson started a fire at a Republican Party office in southeastern Wyoming early Thursday morning. The arson struck the Albany County Republican Party headquarters in downtown Laramie but thankfully no one was hurt and the building only sustained minor injuries. The first-floor office was reported to be on fire around 3:25 a.m. where a glass window was shattered and charred remnants of carpet can still be seen. Local investigator Steven Morgan of the Laramie Police Department confirmed the incident is being investigated as arson with help from other agencies. Agents from the federal Bureau of Alcohol, Tobacco, Firearms, and Explosives are considering the possibility that the attack was politically motivated. Morgan announced there had been no suspect determined yet and did not comment further. 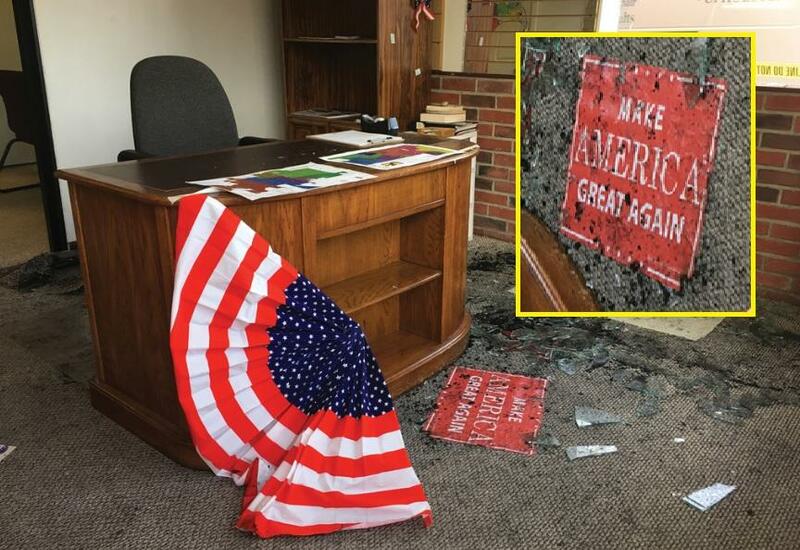 Local news outlet Laramie Boomerang spoke with county GOP chairman Ben McKay who said a "Make America Great Again" sign was left hanging in one of the broken windows. This is how NAZI Germany began. Sad today there is no country to rescue America if the Democrat Globalist NWO tyrants turn us into a police state.. Germany if at first you dont suceed? NATO General Domroise wants to takedown Rothschild free Russia.